Here comes Santa Claus! Took a fire truck down from the North Pole. Hi Santa! We’re so excited to see you around here! Did you have a good ride down from the North Pole? Did you ride in that fire truck all the way? Did you put out any fires along the way? 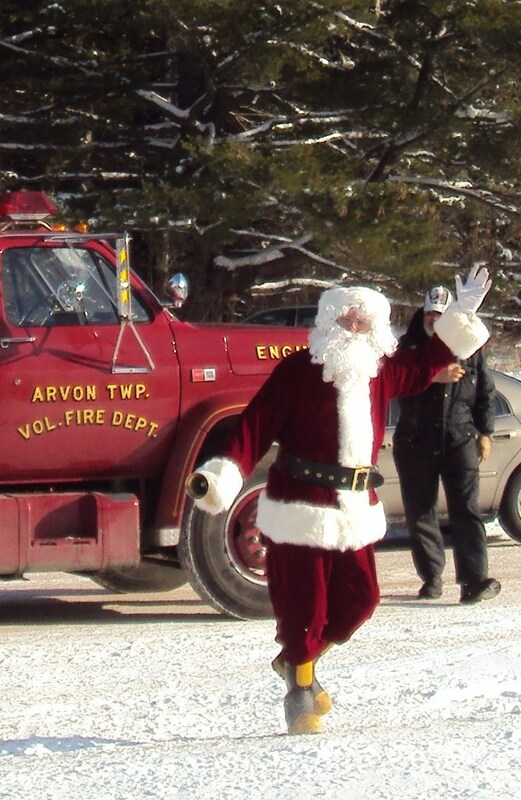 Santa scurried inside the Arvon Town Hall to deliver gifts to eager children. I stood around in sixteen layers of clothing (NOT Grandma’s 1970’s snowmobile suit. We do NOT bring that out in public) waiting for the hayride. We had to wait until Santa passed out all his goodies. Yep. 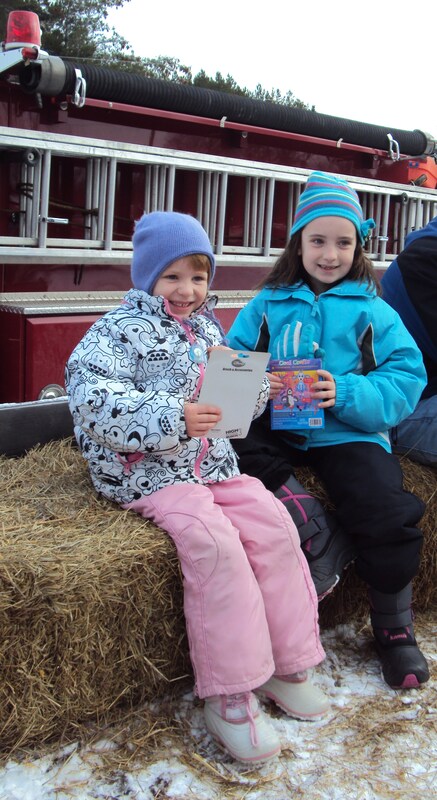 The Fire Department puts on a bona fide hayride every year for all the kids, parents and outdoor bloggers who want to hop aboard. It’s a wagon pulled by your standard four-wheel drive pickup truck. 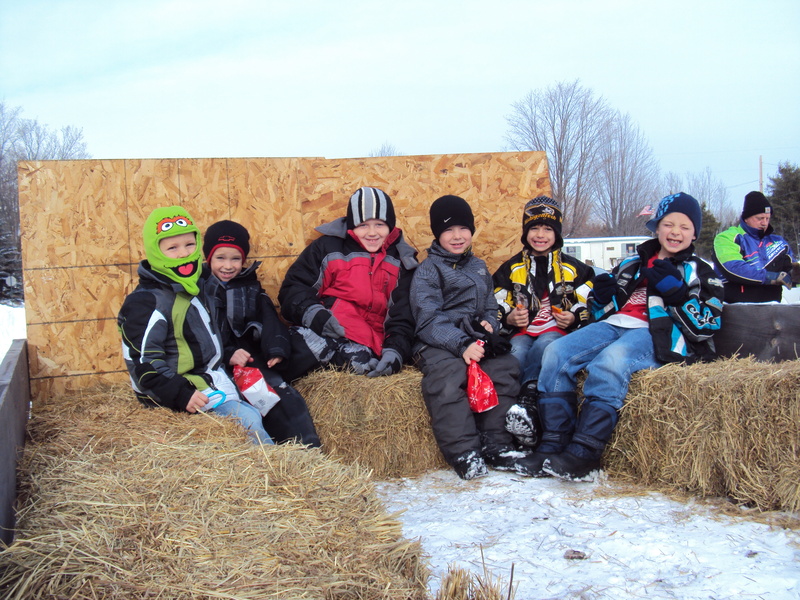 Complete with hay bales for all of us hayride-participants to sit atop. However, the weather was lovely today. Truly lovely. I can’t begin to share how 25 degrees seems like a heat wave after a freezing cold previous day where the temperature barely rose to 10 degrees and the wind whipped around trees with a potent fury. Today felt balmy. At least for those of us with snow pants, hooded sweatshirt, heavy coat, two pair of mittens, warm hat and toasty Sorel boots. After the hayride, it was time to finish shoveling the deck. I love shoveling very slowly. When Barry shovels, it’s all done in one session. When I shovel, it may be two or three days. That’s because one must ENJOY one’s shoveling. One must only shovel until it’s time to quit. Which might be in five minutes or fifteen minutes. Never a half hour. Hope everyone a) gets to see Santa coming down from the North Pole on a fire truck and b) gets to see a little snow for Christmas. That is, if one lives in a snow-prone area of the world. Also hoping c) that you all get to go on a hayride this year. Really! And remember, if you can’t find a hayride pulled by a good old-fashioned horse, a pickup truck will do. 🙂 At 25 degrees you just might have been overdressed! LOL!! I’m jealous of the hayride. We had a balmy sunny day, too. Amazing how much better we all feel. Gerry, the last hayride I ever went on (I think?) was in Traverse City about 1979 or 1980. Isn’t it so wonderful when that sun peeks out? Balmy, definitely. Those winter wonderland photos are gorgeous. What comes across is the blueness of the shadows. 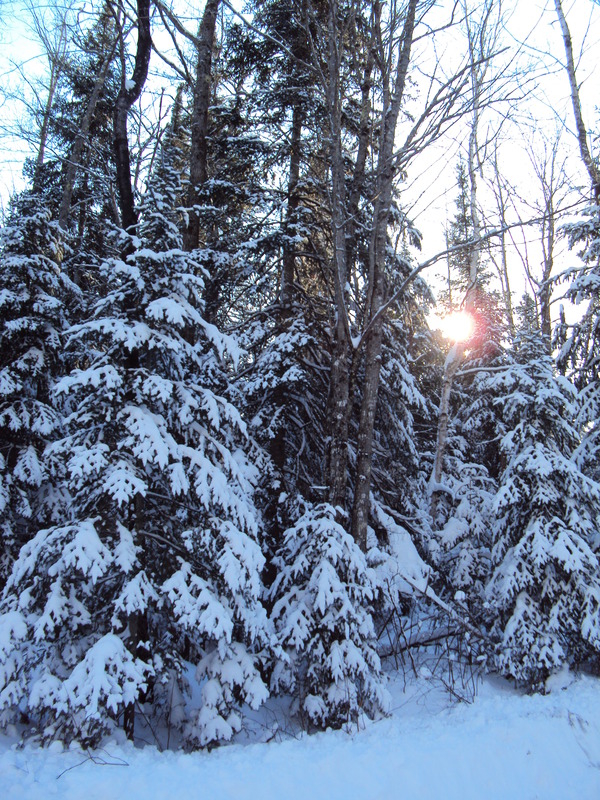 Snow can be so awesomely beautiful. I’ve never been on a hayride though Kip used to work at a cowboy adventure ranch that gave them year round. The kids sure do look cute especially the little guy in the lime green Oscar the Grouch hat. Amy, last year I refused to use the “white balance” in my camera because I loved those blue shadows so much. This year I’ve set the camera on “snow” setting and will probably leave it there til May!! Weren’t those kids so cute? I can’t figure out if it’s crazy or just sad that 25 feels like a heat wave!?!? I’m in your camp on the shoveling…..nice and easy! 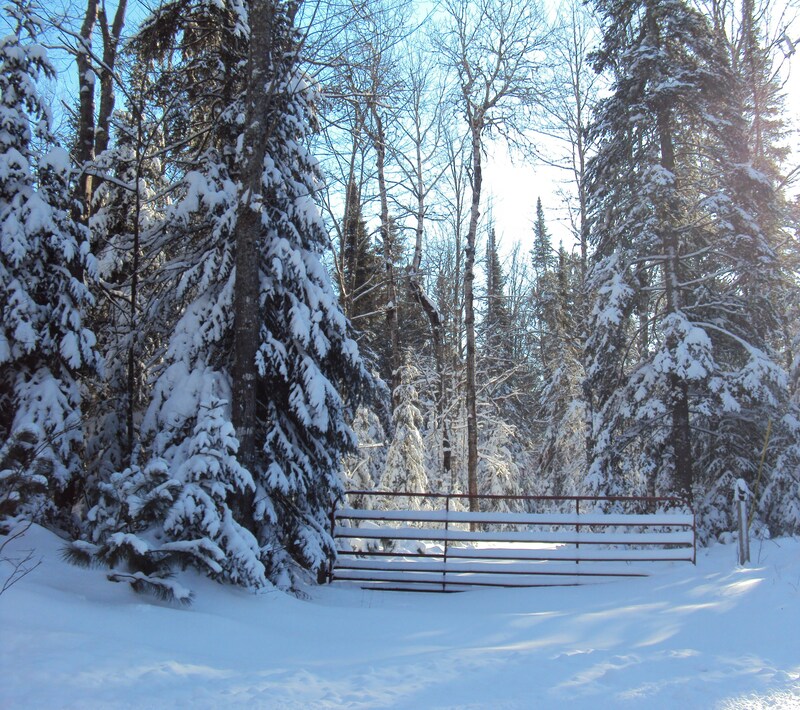 When I was shoveling on Thursday and putzing along at it in my usual fashion, Ricky got frustrated with my slowness – grabbed the shovel and had the little deck on the sauna (where we sat in the lovely summer sun with Kenzie – ‘member?) done in two shakes! Crazy-sad, maybe. I think that heat-wave status has a lot to do with whether the wind is blowing. Because today, at 20 degrees, felt cold again. I am really glad you like that leisurely shoveling technique. What is it about most guys that they have to do the whole job in the shortest amount of time? I think that day with Kenzie and Jen seems soooo long ago! Are we counting the days til summer? LOL! OOOOOOOO my body woke with the alarm this morning and I felt calmer than usual, normally feeling this way I’d want to stay snuggled into bed, however, the body was awake or full up on the calm. I heard wet swooshing outside and thought that perhaps we had snow. IT IS RAINING!!! It all sounds quite lovely pouring down the eaves and into the spout! Dancing and sprinkling upon the ice and snow that is left in the yard! It all feels very good! I will get to see green grass again before more buried white! 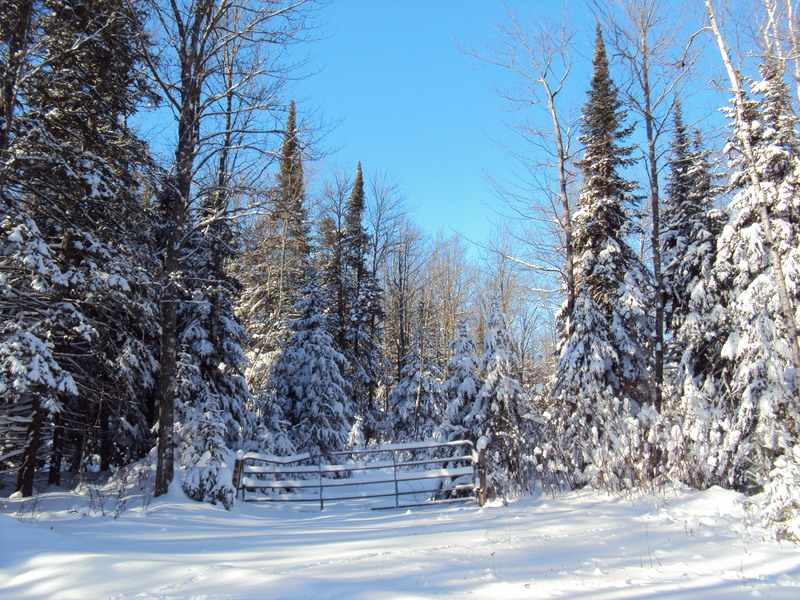 Looking at your trees in snow images, I realize that I do so love the silence and the slight wind whispers of that level of snow. I feel a bit torn, however!!! You have saved me!! 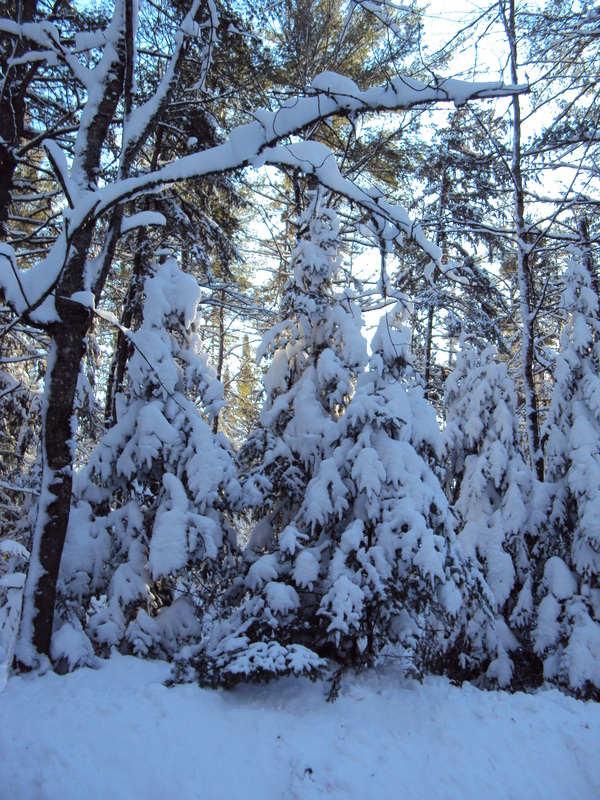 I can hear and see rain here and be joyous AND dance in your snow trees of last year all at once! It is very weird to want to bake cookies and to have loud Christmas music going at 7:02 a.m.! I found this, this morning…. I am SO in love with that quote. I may never recover from the wonder of it… thank you so much, Elisa.